Two days ago, I wrote How to Stop Procrastinating, and I can now report that I was at least moderately successful in following my own advice. I did manage to organize my notes for the group leaders’ guide and get the writing started, which is the moderately successful part. But I also procrastinated some more by playing with my blog — revising my About page and adding Top Posts as a drop-down part of my menu, plus adding a Table of Contents to my Sacred Pauses page and drop-downs for Endorsements and Resources for Your Blog. I hope you’ll check out the fruits of my procrastination, and find them useful. I still have more writing to do before the group leaders’ guide is done, so instead of writing more here, I’ll leave you with this thought from Fearless Creating by Eric Maisel (page 111). Think of that comet flying toward Jupiter. In every instant it can be described as a vector, as a quantity with magnitude and direction. It can be described as an arrow of a certain length pointing in a certain direction. 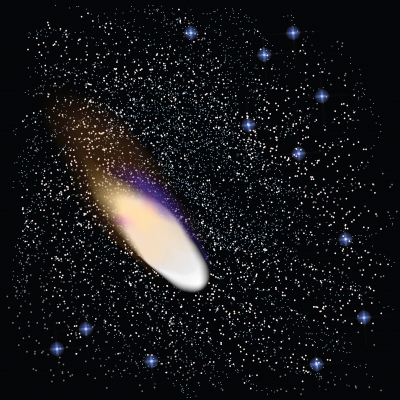 You, if you are to make the short journey from where you are now to where you will work, are that comet. Starting means having momentum and direction. Starting means flying across space right at a target and with sufficient velocity to strike it a real blow. Point yourself in the direction of your work. Is just doing that hard — pointing yourself at the piano, your painting studio, your darkroom, your desk? How profound is our resistance to starting! Right now, do whatever it takes to point yourself in the direction of your work. Good! You’ve aimed the arrow. But with what force will your arrow fly? With what force will your comet strike Jupiter? Modestly? With only a little puff? Or so explosively that the dust cloud can be seen on Earth? Will your arrow bite deep into the work? This morning I’m that comet and my group leader’s guide is Jupiter – at least for another hour or so until I turn back into a pastor on my way to church! So are you procrastinating today, or like a comet on its way to Jupiter, aiming yourself in the direction of your creative work?